People who would like to shed some pounds oftentimes would like to get prescription appetite suppressants that can help them slim down. However, are those prescription appetite suppressants bad for you? Pharmaceutical appetite suppressants may be a right option for morbidly obese people under clinical guidance but given their bad side effects they are not recommended for purely cosmetic weight-loss. So, if you are not morbidly obese, Rx appetite suppressants may actually be bad for you, and you can consider healthier and more natural alternatives. However, only your licensed health care professional can tell you if a specific product is a right option and you should always ask a doctor. Many appetite suppressants contain stimulants (for example, caffeine) that carry risks of negative side effects. Natural Medicines Comprehensive Database (Source of unbiased scientific information) maintains a list of ingredients rated on safety. There are countless all-natural and safer appetite suppressant options to the doctor prescribed drugs on sale that are classified as dietary supplements. Skinny Piggies are yummy appetite suppressant gummies which contain all-natural compounds which have been discovered to decrease appetite in several clinical studies. Do you love snacking on tasty treats but also wish to slim down? 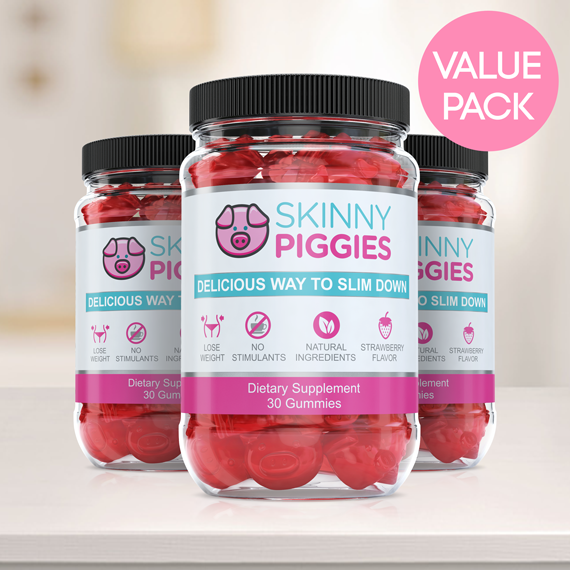 Now, you'll be able to support your healthy diet by enjoying special appetite suppressing gummy supplements called Skinny Piggies! These are delicious all-natural dietary gummy supplements that help reduce cravings and hunger while letting your body to continue being in fat-loss mode. If you want to lose a few pounds, it is not hard to understand: Eat less calories than your body uses daily and you will start losing weight, no question about it! But as soon as you start lowering calories, food cravings will begin, and hunger becomes really difficult to control. This is where Skinny Piggies Gummies come into play! These yummy appetite suppressant supplements are developed to help you to stick with your dietary regime by helping you reduce your hunger. Hunger is primarily controlled in: energy consumption and the stretch in the stomach. After you eat a meal, your stomach gets full and the food stretches it. That is what creates the sensation of satiety and you stop eating. Ok, so what do you do? Enjoy dessert! Take a Skinny Piggy 20-30 minutes ahead of your meal with a full glass of water. When the Skinny Piggy reaches the stomach it will soak up the water and turns into a delicate gel. The gel then takes up space and informs your nervous system that you just had a large meal before you even began eating. 30 minutes later and you may start eating your meal! At that moment, the gel has expanded and you are partly full and that can help you eat a much smaller serving but still end up feeling full and satisfied. Eat one Skinny Piggy and you'll find yourself eating less calories, stop carb cravings and let your body to be in weight-loss mode . This way you can fight desire for food and hunger, food cravings, and eat much less, without being hungry all day. The soft gel enables your stomach to empty slowly leaving you feel full longer. The longer you are satisfied, the less likely you are to remain to eat that allows you to eat much less calories. As the liquid gel surrounds the food you ate, it slows down the digestive function of carbs and normalizes the blood sugar level. By reducing spikes in your blood sugar level you are preventing those unbearable sugar cravings. When you eliminate blood glucose spikes by slowing down the digestion of sugars you are also stopping it from being accumulated as body fat which then causes your body to burn off its unwanted fat. The slower the intake process the longer you remain in fat-loss mode. There's no limit to the number of diet pills on the market today. From fat loss supplements to appetite suppressants, it's difficult to find out what fat loss product may work best for you. Genuine Ingredients: Unlike most weight-loss products, it's actually possible to pronounce all active ingredients in our gummies, knowing that you're nourishing your body with only the best quality nutrition. No Chemicals or Stimulants: Using a weight loss product with no caffeine means that there aren't restrictions on when you may take them, and the formula without irritants means that Skinny Piggies are easy on GI track. 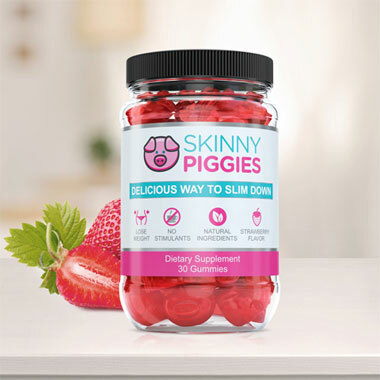 Yummy Flavor: Few weight loss products taste great, and none of them have the same delicious flavor of strawberries, and that means Skinny Piggies gummies are a treat you'll look forward to. Nutrient rich Nutrients: Not only will Skinny Piggies help you slim down, they will also help the healthy nails and hair and keep your skin looking healthy. Losing weight is a challenge, but our delicious gummies are here to help you make your efforts easier on you. You will love the strawberry flavor of our good appetite suppressant gummies so much, remembering to eat them daily will be easy. 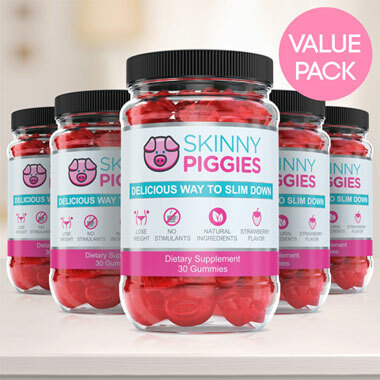 Easy to take and verysatisfying, Skinny Piggies are weight loss gummies that can help you too.